While we’re on the subject of kids, school, and food this week, here’s a shout out for a film I’m going to have to find room for on my top ten food documentaries list. What’s On Your Plate? features two New York City middle school students, Sadie Rain Hope-Gund and Safiyah Kai Russell Riddle, taking viewers on a food tour that’s as entertaining as it is educational as they set out on a mission to figure out where their meals come from. The 76-minute film is part of the current Whole Foods Let’s Retake Our Plates film series and has run on Discovery Channel’s Planet Green. Click here for screenings and watch a trailer here. This doco is directed by veteran social justice film-maker Catherine Gund, mom to one of the budding food activists. The dynamic diet-conscious duo spend a year in front of the camera as they explore their place in the food chain, and ask questions about where the food they eat comes from, how it’s grown, and how far it travels from the farm to their fork. Pitching this flick to a Hollywood agent you’d sum it up as two urban Nancy Drews meets Food, Inc., as The Atlantic did. The girl guides talk to friends, family, food activists, farmers, food sellers — and each other — as they investigate issues around health, environment, nutrition, food security, and access. The interviews with politicians and public school food officials are classic. The break beat poet is fresh and funky. It’s packed with so many teachable moments in bite-sized bits that I suspect it will engage many kids in a conversation about eating. And the tone is matter-of-fact and non-judgmental. We learn Sadie has genetically-linked high cholesterol controlled by diet, and that Safiyah’s family is vegetarian. 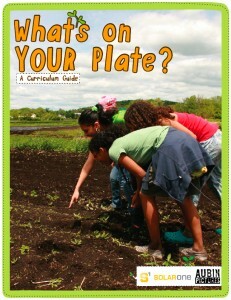 On a recent tour of a middle school in my neck of the woods, I saw a sign for a class called “What’s On Your Plate?” and I wonder if it’s based on the film’s 64-page companion curriculum guide on school food, health and access, and local food. (It’s spring break in Berkeley this week, so I can’t confirm). I hope so. What’s On Your Plate? is a terrific teaching tool, told in the cadence of 11-year-old kids. Pretty savvy and sophisticated multi-racial city kids with deep connections on the food front. But kids nonetheless. Concepts like high fructose corn syrup get equal billing with a popular edible food-like product known as Funyuns. 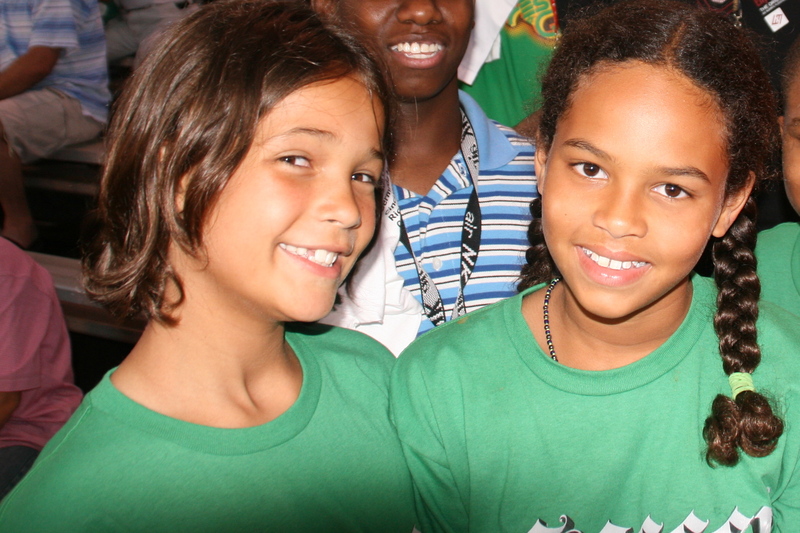 The film works best when we meet people the tweens find organically. Like the folks who front the CSA (Community Supported Agriculture) in their area, the Latino Angel family farmers, who struggle to make a living on the land in upstate New York, and the school dad who had a heart attack that proved a wake-up call for his family’s eating habits. I was less jazzed to see the typical talking heads of the good food movement. But I’m a somewhat jaded adult and many kids won’t know Anna Lappe and Bryant Terry, both of whom, to be fair, bring important ideas to the table. The film ends, fittingly, with a wrap party where food plays a central role. There’s even cute animation and cool music too. Less scary than Food, Inc., less sensational than Food Revolution, and less sad than both these edible exposes, What’s On Your Plate? does what children have always done best. It offers hope, even in the face of seemingly insurmountable odds. Who knew you could grow raspberries in a window box in Manhattan? You can! The kids even help the Angel family organize a CSA to fund the farm. Clearly, the youngest generation of edible entrepreneurs can bring about change in their communities. A good choice for family movie night, I’m looking forward to watching it with my own 11 year old. I know he’s going to love that school science experiment involving marshmallows, walnuts, and those Funyuns. Playful, positive, personal, and political without being preachy, What’s On Your Plate? is worth watching. So kudos to the kids and the movie-making mom, who made a wise decision to let the children tell the story. Tags:anna lappe, bryant terry, catherine gund, community supported agriculture, food documentaries, food inc., food revolution, sadie rain hope-gund, safiyah kai russell riddle, what's on your plate? Think of agents for change in American eating habits, and Berkeley’s Alice Waters and Michael Pollan come immediately to mind. Indeed, eat-more-greens advocates can appear as white as Wonder Bread. On the menu at the local La Pena Cultural Center last night: some much-needed color in the conversation about good food matters. Read my entire post on the foodcentric performance piece Visceral Feast over at Berkeleyside. 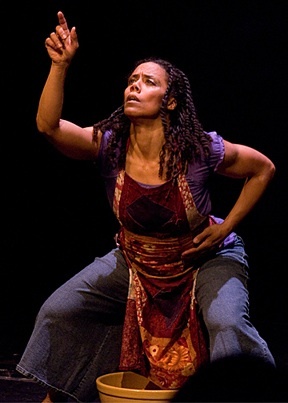 Well, turns out, Amara, artistic director of the Oakland-based Deep Waters Dance Theater, has been investigating edible issues, such as where food comes from and its impact on the community and the environment, in performance pieces that address the soul and spiritual connections to eating and cooking. Last year she showcased a work in progress, “Our Daily Bread,” as part of an artist in residency at CounterPULSE, a non-profit theater in San Francisco. Amara describes herself as “mostly vegan” not initially for political reasons but because she doesn’t care for the taste of meat. But she cooks meat for others and acknowledges her roots as a child growing up eating her mother’s gumbo. She’s planning several food parties as part of her exploration of eating this year. One she’s dubbing Raw Meat, where she hopes raw food folk will dialogue with confirmed carnivores. Find Amara’s Recession Root Stew recipe, inspired by the times and in the spirit of African American food traditions, right here. It’s vegan, can feed lots of folks, and includes dinosaur kale, cilantro, and coconut milk. Sounds just the dish for a cold winter’s night. At last night’s performance the audience was asked to share a favorite food memory. I listed my sister’s pavlova and family barbecues with the proverbial “shrimp on the barbie” (Aussies call them prawns). And Vegemite on white toast, comfort food when you’re sick. All of these foods remind me of home.